WATERMELONS: THE FUEL OF THE FUTURE? - What About Watermelon? You are here: Home / General / WATERMELONS: THE FUEL OF THE FUTURE? I drove a 1973 Monte Carlo while I was in college. It was a nice car, in good shape, but I felt bad that it only got about eight miles to the gallon. I felt that way for two reasons: First, that it was environmentally unfriendly, and because I was paying more for gas than I was for tuition (or so it seemed). 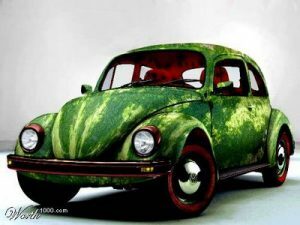 I traded it in a long time ago for a more Earth-friendly and reliable mode of transportation, but it turns out, scientists are on the verge of being able to convert any car – even my old Monte – into alternative fuel-burning vehicles of the future thanks to… betcha can’t guess what it is…watermelon! According to studies by the Agricultural Research Service (ARS) in Oklahoma, the simple sugars found inside a 20-pound watermelon can be converted to yield seven-tenths of a pound of ethanol. We’ve known for a while that corn and sugarcane can be used to produce ethanol, but now watermelon has joined the fray, and that’s good news for the watermelon industry. It’s good because out of the four billion pounds of watermelon grown each year for harvest, about 20 percent (or 800 million pounds) go unharvested and unused because of blemishes or deformities. Now those misshapen and scarred products of nature have a purpose! A purpose some would say is much greater than offering a delicious meal on a lazy Sunday afternoon. Came across this site while researching a big watermelon project i am organizing. Part of the project involves our Watermelon Express which will be giving away free watermelon in July and August. Who would turn down free watermelon? This campaign is mostly based on building brand awareness and introducing compancy as we have nothing to sell just yet. Perhaps as it moves forward I will update you. Maybe it will be something that your blog or other watermelon promoters like to see. You’re right, Ed…it’s hard to turn down free watermelon. Keep me posted on your efforts!